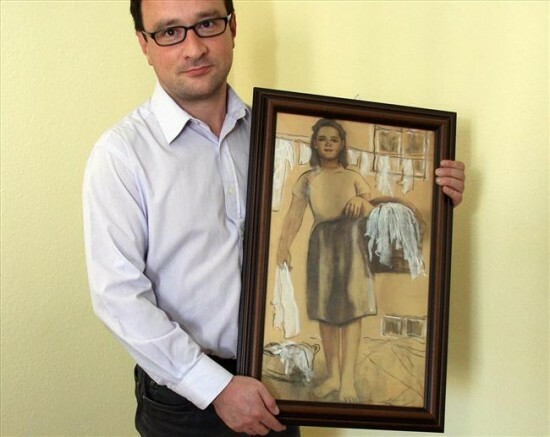 Tomasz Urynowicz, a 37-year-old art lover from Nowa Huta, Poland, has fallen in love with a young brown-haired girl hanging laundry in one of his paintings. Urynowicz first saw the artwork painted by Antoni Maria Kwiek in 2001, in a art gallery and was fascinated by the beauty of the girl it portrayed. He bought it on the spot and spent the last decade searching for the girl. 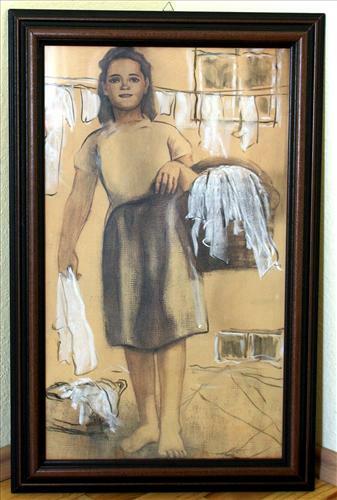 He hoped his neighbors might know who she was or where the artist who painted her in 1955 was located. “I just wanted to meet her, sit down and have coffee and a chat – to see who she is and what her life has been like,” he explains, but says he would have been happy enough to just track down Kwiek. After years of failure tracking down the girl who “has brown hair that shimmers in the sun”, Tomasz is now looking for a priest who will agree to marry him with the painted version of the girl of his dreams. “I don’t know what the laws on this sort of thing are in Poland. But if I can’t do it here I’ll go somewhere else and do it,” he says, and 10 years of searching tell me he means it. If he actually goes through with this unusual wedding, I’m pretty sure he’ll be the first man in the world to marry a painting.